Who told you that story? Why did you like that story? I have heard a lot of stories in my life. I like to listen to that type of stories which are based on history or which teach us some moral values. 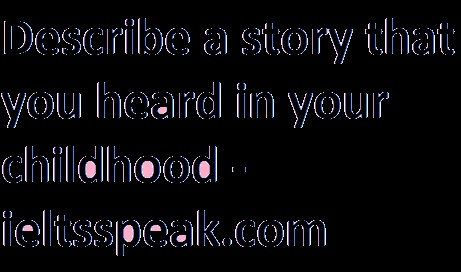 when I was in my childhood stage, my mother used to tell stories on every night. I had heard a lot of stories from my mother, but here I am talking about a story that is my favourite story. The name of that story was "THE GREEDY DOG". this was a very interesting story. This tale had a great moral value. Explain why you remember this story? Since my childhood, I have learned a lot of stories. Especially from my grandmother who told me innumerable stories. Although she narrated me wide-ranging stories. But here I would like to talk about a story of a mouse who lived in a forest in his burrow. Suddenly he noticed that something had fallen with the thud on the terrace his home. Without having noticed anything, he came out and started shouting and running very fast, out of fear that the earth was going to explode soon as something very massive had collided with the earth. Listening to him the other animals such as rabbits, goats and sheep started chasing him and running out of the forest. But when the king of the forest, the lion came in their way all the running animals stopped and narrated what had happened. The lion rebuked and asked the mouse to take him to his home. When all the animals along with a loin searched the Burrow of the mouse, the lion noticed that the home of the mouse was near the root of a mango tree and that a ripened mango had fallen on its terrace. So this is the answer of favourite childhood story cue card. Seeing this the lion scolded every animal and asked them to go to their homes. I remember the story so far because it has rendered me a good message that before acting upon anything we must judge this situation and that not to do anything in haste.